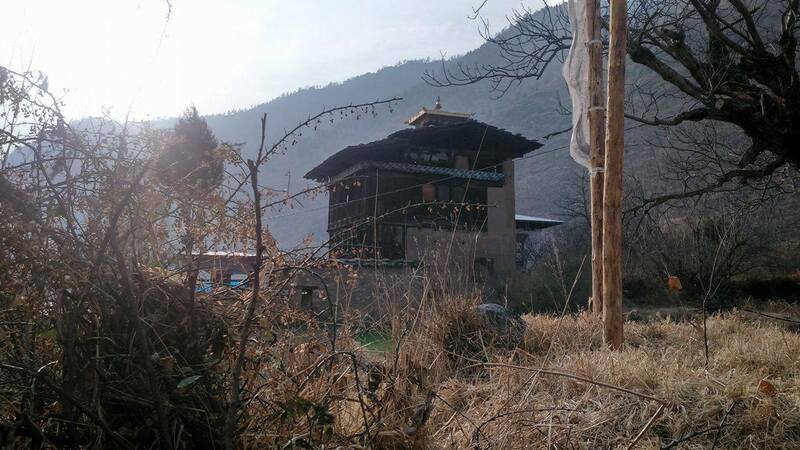 Across the river at Wang Sinmo, the sight of the ancient house in Danglo is so prominent that one can't help stealing several glances from the highway at it. The house, blacked with age was the home of Khandro Sonam Palden, consort of Phajo Drogom Zhigpo who lived from 1184 to 1251. The fascinating details of the lives of the divine couple has survived centuries undiluted. Their popularity is evident from the Bonko festivals held in most village in western region, which is an enactment of life of Phajo. 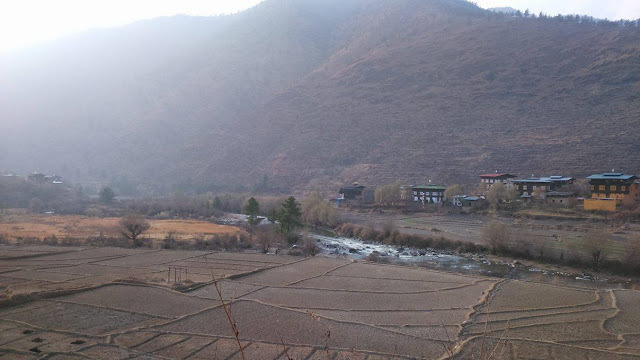 Ancient History of Bhutan can be compared to a blank sheet of paper with few dots separated by huge gaps. After Guru Rimpoche's visit in 8th Century the next dot of history documented is probably the story of Phojo and Khadro. 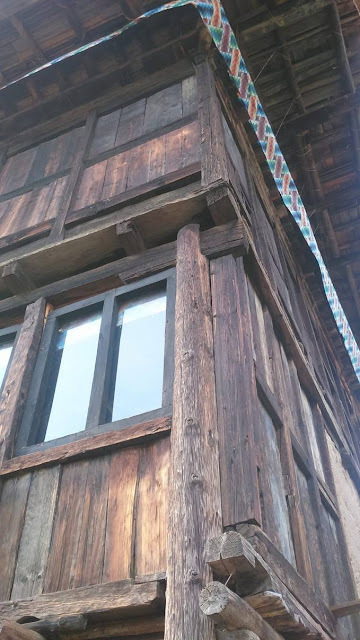 To pinpoint the 900 year old birthplace of Khandro Sonam Palden today is intriguing, although the house itself being that old is out of question because over these many years we can assume the house must have been rebuilt and renovated dozens of times. I must have travelled on that highway for hundreds of time and that many times I have looked at the house and wished to visit it. It was just there across the river and all these years I have pushed it for another day. Now I think I have reached the age where if I wish to do something I go and do it because I have realised the importance of take charge of my life. It's equally important to have friends who share your passion to make every moment worthwhile. With Nawang Phuntsho I just have to tell him my next plan and he would be there ready to go. Our passion dragged our families and even my cousin's family to the place. And from there I looked at the highway and wondered why I took so long to take this short journey. Upon reaching the village the road winds away from our destination, so we stopped to ask a little boy standing by the roadside for direction. The boy said he would show us and began running ahead of our cars. We followed him for some time and realized that it was farther than we expected and though full of energy the boy was exhausted. We asked him to get in the car and he did. 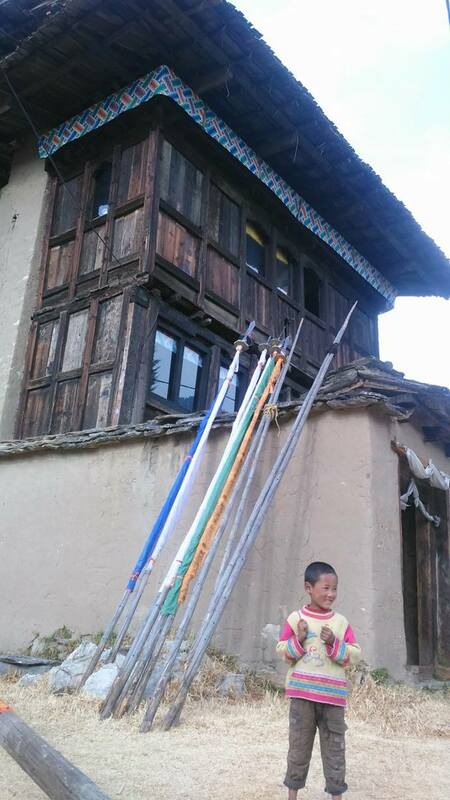 Once in the car he introduced himself as 7 year old Passang Dorji studying in PP. From the way he talked he sounded like a 50 year old. By and by he became our tour guide and stayed with us for the entire duration. He didn't know the history and significance of the place, which I am sure he will learn now, but he made our tour special. What I envied most about the boy was his independence, which can't be taught in the school. He led a group of adults with so much confidence. He rightfully earned a decent fee for his service. I have always wondered about that house too, Thank you. There is also another house just above the highway. The name of the Village of Khandro is Danglo. Simu is the village on the other side of the river. Thanks you so much. I couldn't remember the name. Anything you wish to say about the post? To Mr. Khaw Boon Wan, What did you expect? The Truth Beneath the Skin. Remix of Well known Saying.. Some Crazy posts and imprints I have come across so far ! 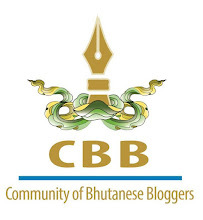 Amrith Bdr Subba's diary | My Personal Journal! Chhimi's collection of the world! Lotus's Perspective- Journey through my teaching career. Colour your life with crayons... Pink-Blue... are d best!!! New addition to my book review website! "Peace comes from within. Do not seek it without"
Hydropower project and environmental impacts! Yonten's free flow verses & poems: The Life as I see it! My University Life Abroad..just a portion of it. Writing: a way of reaffirming my own existence. You, me and our life! Being a leader. Coming to the Edge. Opinions in PaSsu Diary are my personal and therefore do not represent that of my school, ministry or family. Most of the articles are based on personal observation and not necessarily true. If some pieces are found potential of defamation let me know before you sue me, because I would have my justification or apology accordingly. Copyright (c)PaSsuDiary | Passang PaSsu Tshering 2006-2012. Simple theme. Powered by Blogger.